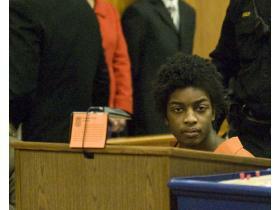 Dominic Oyerinde during his competency hearing Wednesday. Oyerinde was ordered to stand trial after being denied his request to represent himself. Nov. 19, 2009 · 12:50 p.m.
Dominic Oyerinde was found competent to stand trial for open murder and car jacking charges by a Washtenaw County Circuit Court Judge for the death of his ex-girlfriend, 17-year-old Anna List, prompting Oyerinde to request to defend himself. He quietly said he wanted to defend himself instead of his current public defender, Timothy Niemann. Niemann approached Judge Archie Brown’s bench to set a trial date. After Niemann, Brown and Assistant Prosecuting Attorney set the dates, Oyerinde was asked why he wanted to relinquish Niemann and defend himself. Brown called the request “not appropriate” at that time and set a final pretrial date for February 10 and a trial date for March 8. Oyerinde is accused of hitting List, a former Ann Arbor Huron student, over the head with a hammer outside Ypsilanti’s Recreation Park following an argument early on the morning of January 13. A passerby found List’s unconscious body in the snow and called for help, but she died from two blows to the head after remaining in a coma for a week.